The Coollaboratory ALPHEOS Liquid Cooler offers by its perfectly co-ordinated aquifer system a brilliant cooling efficiency. By the multiplicity of the superfine lamellas, which have a small distance too each other, results an extreme flow rate which dissolves the warm-restraining boundary layers. 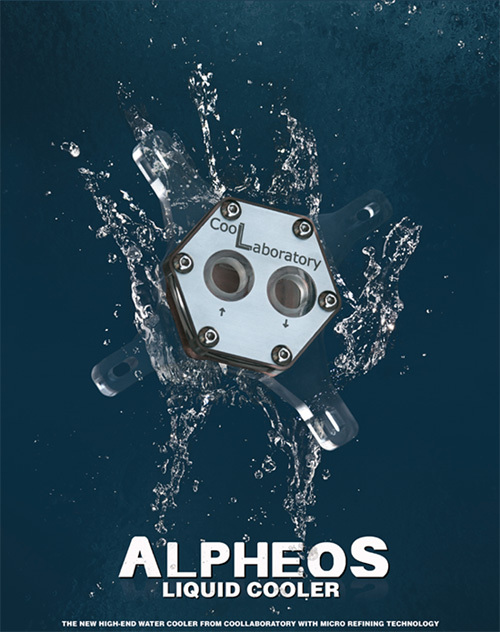 Thereupon the Coollaboratory ALPHEOS Liquid Cooler catapults itself into the best regions of all available water cooler at the market in the matter of cooling performance. It was provided on basis of computational fluid dynamics, therefore all death water zones were eliminated, which additionally affects the cooling performance positively. By a pretreatment of the high-quality cooler base with liquid metal in a particularly developed coating process (Micro Refining Technology) a high-quality improvement of the heat sink is reached. Beyond that the Coollaboratory ALPHEOS Liquid Cooler is easy-care as no extremely fine nozzles, which remind of a filter, were used. The structure of the base was developed on basis of single core and multi-core CPUs. Thus older, also newer and future CPUs can be cooled lasting optimally. Cover and aquifer system plate consist of a shatter crack-resistant special plastic. Therefore shatter cracks at the connecting thread belong to the past. 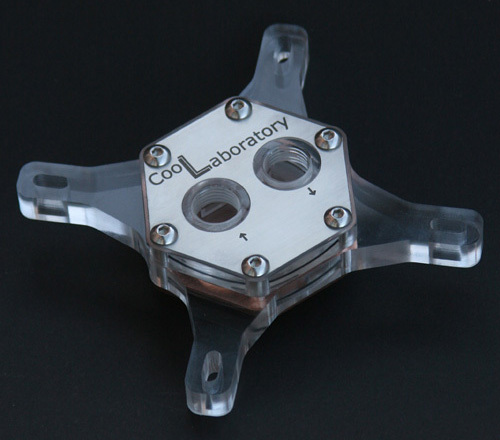 These entire characteristics make the Coollaboratory ALPHEOS Liquid Cooler almost fail safe. Please note: This product is end of life and we don’t offer it in our shop anymore!